No. 14 Rush Truck Centers/Cummins Ford Mustang driver Clint Bowyer and his Stewart-Haas Racing (SHR) team judge their success on the Monster Energy NASCAR Cup Series each weekend based on the scoring sheet after every practice, qualifying session and the race. But this weekend at Texas Motor Speedway in Fort Worth, Bowyer and his friends at Rush Truck Centers add an additional measurement to determine the weekend’s success – technician recruits. Rush Truck Centers has been the primary partner on the No. 14 team since Bowyer arrived in 2017 and has been with the SHR organization since 2010. The San Antonio-based company with more than 120 locations and 7,000 employees has used Bowyer and the team to appeal to NASCAR fans as one way to recruit the technicians it needs to operate the largest network of commercial truck and bus dealerships in the country, with locations in 22 states. According to Rush Truck Centers, the trucking industry is expected to need 200,000 diesel technicians over the next 10 years to keep up with maintenance demands. To help meet the demand, Rush will host a display in the fan midway this weekend where its recruiters will discuss with fans and prospective applicants the work its technicians do on the trucks, as well advantages of joining the company. A Rush Truck Centers truck and Bowyer’s No. 14 car will also be at the display. Bowyer will visit the display twice and talk about technician careers. It’s diesel truck weekend on the No. 14 at Texas as Cummins makes its first appearance in 2019. While Cummins is a corporation of complementary business segments that designs, manufacture, distribute and service a broad portfolio of power solutions, it is best known for its diesel truck engines. Cummins and Rush Truck Centers help SHR get its racecars to the track each weekend. SHR’s Peterbilt Model 389 haulers are equipped with Cummins engines and RushCare Telematics and supported by the RushCare team, which monitors and reports critical fault codes, vehicle performance and driver habits. This ensures the haulers remain in peak condition while traveling thousands of miles from race to race each season. Cummins’ lineage dates back to the inaugural Indianapolis 500 in 1911, when company founder Clessie Cummins was on the pit crew of the race-winning Marmon Wasp of driver Ray Harroun. Since its founding in 1919, the company now employs approximately 58,600 people and serves customers in about 190 countries and territories through a network of some 500 company-owned and independent distributor locations and approximately 7,500 dealer locations. It’s also headquartered in Columbus, Indiana – SHR co-owner Tony Stewart’s hometown. Bowyer arrives at the ultra-fast 1.5-mile Texas oval 13th in points after a seventh-place finish at Martinsville (Va.) Speedway Sunday. He’s posted three-top five finishes and 11 top-10s in 26 career races at Texas and qualified in the top-three in three of the last four Cup Series races. He’s even won at Texas, taking home the trophy in the 2006 Gander Outdoors Truck Series race. Brad Keselowski won his second race at Martinsville Speedway, leading a race high 446 laps in the Monster Energy NASCAR Cup Series STP 500. The No. 2 Team Penske Ford Mustang powered by the Ford FR9 engine, recorded their 40th MENCS win as Team Penske with Roush Yates Engines since 2013. Ford Performance now has 30 career MENCS wins at the famed “Paperclip”. After a strong qualifying performance on Saturday, by the Ford Mustangs, No. 22 Joey Logano started from the pole position while No. 10 Aric Almirola from Stewart-Haas Racing P2, No. 2 Keselowski P3, and No. 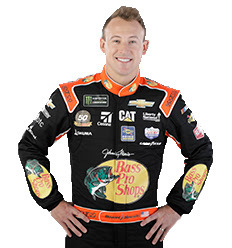 4 Kevin Harvick from Stewart-Haas Racing in P4. Joey Logano led the first five laps while Keselowski took the lead and remained out front for the next 319 laps which included 2 stage wins. Keselowski regained the lead on lap 374 and never looked back. Keselowski worked through race traffic throughout the 500-lap event to take the checkered flag .594 seconds in front of Chase Elliott, marking the third consecutive Ford Performance win at Martinsville. Ford Performance teammates led a race high 451 laps out of the 500-lap race; Brad Keselowski 446 laps and Joey Logano with 5 laps. It was a great day for Ford Performance racing with six Ford Mustangs finishing in the top-10; Team Penske teammates, Keselowski P1, No. 12 Blaney in P4, Stewart-Haas Racing teammates No. 4 Harvick P6, No. 14 Clint Bowyer in P7, and Aric Almirola in P9, and Daniel Suarez P10. NASCAR heads to the longhorn state, to the Texas Motor Speedway. Reference the full 2019 schedule on www.roushyates.com. “It’s really tough. Our NAPA Camaro was good, I felt we were about as even with him as we could be," Elliott said on pit road following the race. “I felt like when he did get the lead, there was a little advantage to being out front, being able to work traffic your way and kind of play off it and what not. “I was pretty well content on moving him out of the way. But maybe next time." “You know, I think the stats maybe look a little bit more dominant than I think it really was," Keselowski said. “I thought Chase was probably the best car most of the day today and he passed me there with 150 or so to go. I thought that might be the end of our day, but I was able to learn a few things from him and kind of dissect his strengths and weaknesses and make some adjustments of our own and come back out and be a little bit better for it. “I feel like last Fall we were probably even a little faster than we were today and we lost some spots on that last [pit] stop and it cost us a win, where today it was the opposite of that. We were able to keep our track position, and that was so, so key to being able to win today because I think Chase, if he’d been out front that run, he would have drove away from the field with what I saw from his car." Ricky Stenhouse Jr. battled through 500 grueling laps at Martinsville Speedway to finish 25th in Sunday’s Monster Energy NASCAR Cup Series (MENCS) race at the half-mile track. The two-time Xfinity Series Champion started the race from the 24th position in his Fastenal Ford Mustang and immediately began working his way forward. By the first caution of the race on lap 65, Stenhouse had navigated to the 19th spot. It was then that crew chief Brian Pattie brought the Ford Mustang down pit road for the first pit stop of the day. The handling of the Fastenal Mustang soon began to deteriorate, with Stenhouse complaining of a tight-handling race car. The Mississippian began to fade backwards in the pack, ultimately giving way to the leaders and falling one lap down just before the end of the first stage. As the first car not on the lead lap, Stenhouse received the lucky dog and would restart for the second stage from the 25th position, but on the lead lap. Stenhouse struggled to improve his position from that point on, and the handling of his car continued to present issues for the team. He would lose a lap again to the leaders before the end of the second stage at lap 260, taking the green-white checkered flag 26th. A stellar pit stop from the Fastenal crew put Stenhouse back into the lucky dog position, but an extended green flag run left him unable to capitalize on the free pass. He would ultimately fall a second lap down to the leaders and finish the 500 lap race 25th. Next up for Stenhouse and the No. 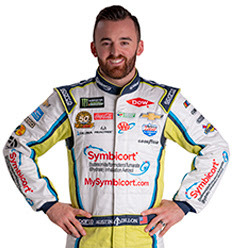 17 team is the O’Reilly Auto Parts 500 at Texas Motor Speedway on Sunday, March 31. Race coverage begins at 3:00 p.m. on FOX. Coverage can also be heard on PRN and SIRIUS radio channel 90. An ill-handling car forced Ryan Newman to a 23rd-place finish at Martinsville Speedway Sunday afternoon in his Acorns Ford Mustang. "We had our work cut out for us today. It makes for a sleepless Saturday night when you qualify far back in the field at Martinsville Speedway, but it sure makes for a fun Sunday afternoon. We had a solid No. 3 Symbicort (budesonide/formoterol fumarate dihydrate) Chevrolet Camaro ZL1 during the first run and methodically passed cars one by one. It was wild. We made it far enough up front to earn stage points at the end of Stage 1. It was difficult to keep up with changing track positions throughout the race but we made a solid day out of starting deep in the field. I hope everyone at AstraZeneca enjoyed the race. I'm really pumped about the direction this team is headed and can't wait for Texas Motor Speedway next week." “Even when we unloaded here in practice, we just weren't quite up on the speed charts like we expected to be,” said Busch, who had won the previous two Cup races at ISM Raceway in Phoenix and Auto Club Speedway in Fontana, Calif. “First run off the truck was really good, but as the track took rubber, our car just kind of slowed down and we just didn't have what we needed there. “Overall, though, today the midpoint day of today's race was a bit ugly for us, and then we turned it around, and thankful to have (crew chief) Adam Stevens and all my guys that give me everything that I need to kind of go out there and work with, and we were able to turn our day around. Fast pit stops got us a lot of track position today. It was hard to pass, besides rooting a guy off the bottom, and even when you tried to do that, they just cut your nose off and you lose a spot. Denny Hamlin was philosophical about the uncontrolled tire penalty that sent him to the back of the field for a Lap 272 restart in Sunday’s STP 500 at Martinsville Speedway. Up to that point, Hamlin had run consistently in the top five, but as good as the cars of race winner Brad Keselowski and runner-up Chase Elliott were, Hamlin didn’t think the infraction cost him a chance to win the race. The most recent Daytona 500 winner worked his way back to fifth at the finish and wasn’t overly disappointed with the result. “We’ve got to get better,” Hamlin said. “We know that. We’re struggling a little bit right now, for sure, but certainly it’s a team thing. Last week I had a speeding penalty, so it all equals out. If you’re not going to be the best car, you have to execute perfectly. ● Daniel Suárez started ninth and finished 14th. ● Early in the stage, Suárez radioed that his No. 41 Haas Automation Ford Mustang was tight in the center of the corners but loose on entrance and exit. ● During a caution on lap 67, Suárez pitted for four tires, fuel and wedge and air pressure adjustments. ● Near the end of the stage, Suárez reported that he was struggling for grip off the corners. ● Pitted for tires, fuel and slight chassis adjustments at the conclusion of the stage. ● Started 13th and finished ninth, collecting two bonus points. ● Stayed out during a caution on lap 147, gaining valuable track position. ● Suárez worked his way back into the top-10 by lap 231. ● At the end of the stage, pitted for four tires and fuel. ● Started 11th and finished 10th. ● Suárez battled for position with the No. 3 of Austin Dillon near the end of the 500-lap race. ● During the race’s final caution came on lap 447, Suárez pitted for four tires, fuel and an air pressure adjustment. ● Started ninth for the lap-455 restart and finished 10th. ● Suárez earned his second top-10 of the season and his second top-10 in five career Monster Energy NASCAR Cup Series starts at Martinsville. ● Clint Bowyer started 10th and finished sixth. ● Reported his car was loose in the initial laps. ● Turned in some impressive lap times as he climbed into the top-five by lap 32. ● Continued to fight a loose-handling car, but the No. 14 looked to be one of the fastest cars on the track. ● Bowyer started sixth and finished eighth. ● Dropped from sixth to 13th after slipping in grease in turns three and four immediately after the start of the stage. ● Climbed back up to eighth before the end of the stage. ● Told the crew his car was loose in and off and needed more drive off the corners. ● Bowyer started third and finished seventh. ● A quick pit stop during the stage break moved Bowyer from eighth to third for the start of the final stage. ● Raced in third with 200 laps remaining, again turning fast lap times. ● Caution with 186 to go saw Bowyer visit pit lane, but a speeding penalty dropped him to 23rd. ● Bowyer drove back to 13th when another caution brought him to pit lane with 124 laps remaining. However, a second speeding penalty sent him to the back once again. ● Bowyer had driven up to 13th when the next caution came with 54 laps remaining. ● He pitted without incident and restarted the 500-lap race in 10th with 50 laps remaining. ● Bowyer made it back to seventh before the checkered flag fell. ● Bowyer earned his second top-10 of the season and his 16th top-10 in 27 career Monster Energy NASCAR Cup Series starts at Martinsville. ● Bowyer finished sixth in Stage 1 to earn five bonus points and eighth in Stage 2 to earn an additional three bonus points.